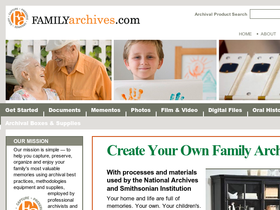 Visit Family Archives online at FamilyArchives.com for all your archival needs. Family Archives mission is to help you capture, preserve, organize and enjoy your family's most valuable photos, papers, stories and mementos using archival best practices, methodologies and supplies. Family Archives uses the same methodologies and supplies as professional archivists and museum experts from around the world. Save on your next purchase from FamilyArchives.com with Family Archives discounts, Family Archives coupons, Family Archives promotions and Family Archives savings from 58coupons.com. Enjoy 15% savings on orders from Family Archives when you use this code at checkout. Hurry, this is a limited time offer. Store all those precious art pieces your children have made you through the years in these Archival Artwork Boxes from FamilyArchives.com for only $11.50 per box. Get started getting all your photos into Archival Photo Albums for only $21.54 from FamilyArchives.com. There's no time like the present to get started preserving your families photos and mementos. The Starter Kit from Family Archives makes it so easy to start for only $66.17. Click link to get started. Are you confused about how to get started preserving your family photos and more in an archival way? No worries, Family Archives has a free downloadable guide to help you get started. Click link for details.